I loved them because not only did they perfectly capture something he is into at age five, but because they were candy-free. Goodness knows, kids get enough candy on Valentines! Have fun with the colors of the jars: Use this template on blue and cream cardstock – blue for boys and cream for girls. 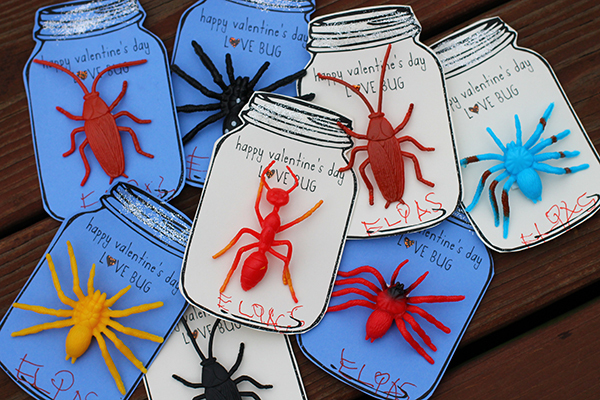 Buy your bugs at The Dollar Store: We found packs of 8 bugs for $1. Technically spiders are not bugs, but 5-year-olds aren’t technical. You can also find lots of plastic bugs on Amazon. Add glitter: We used silver glitter glue for the jar tops and red glitter glue on the heart. I simply spread a line on the jar top and Elias smeared it with his finger. Do your writing before adhering the bugs: Obviously flat paper is a lot easier to write on! If your child is young, do the project in stages: One night we did the glitter glue and then let it dry. The next night, Elias wrote all of his friends’ names. Then he wrote his name on all the cards. Then we attached the bugs! This extends the fun of making the valentines. Use pop dots for the bugs: Foam pop dots held the lightweight plastic bugs nice and secure. You could also use thick glue dots. I just used what we had. 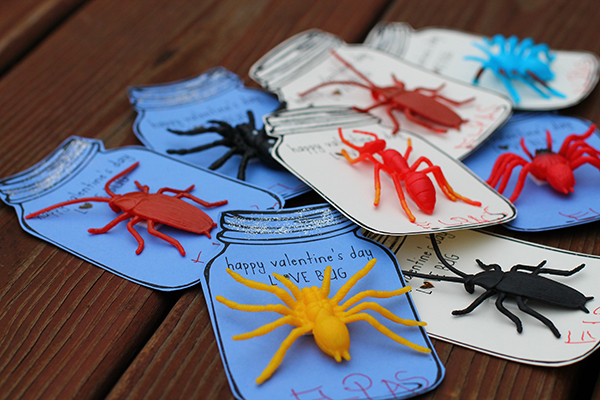 These love bug valentines came together quick and easily. 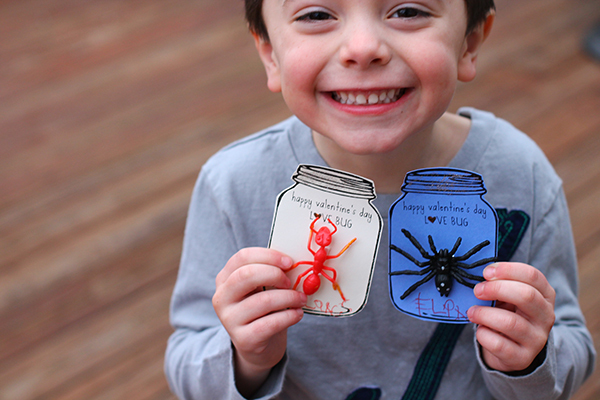 Elias had so much fun making them and can’t wait for Valentine’s Day to pass them out! For more Valentine’s Day ideas, check out my Valentine’s board on Pinterest. Are you making Valentine’s this year? These are so cute! I love how you are able to include Elias into all of the stages of making them! So cute! Did you find the bugs at Dollar General or The Dollar Tree? Those are so cute, good idea to print on different colors and I’m glad you shared how you attached. I have seen that pin before and wondered how they were stuck on. I think in the future I may very well be doing something like this with my little guy. I love how happy Elias looks, what a big beautiful grin! Thanks for sharing your adapted version of the one on pinterest! I love the idea of printing them on blue paper! Do you happen to have the template? The link to the one you posted is for a blog that is invite-only so I can’t access it. Thanks!